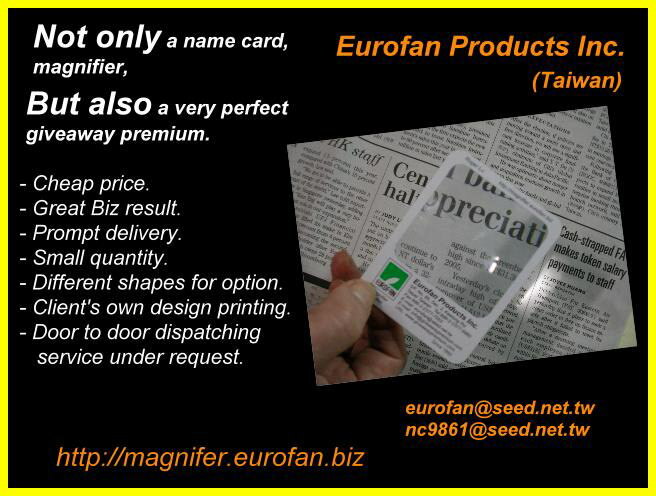 About US - EUROFAN PRODUCTS INC.
We set up the production of Flat magnifier, Pocker Magnifier, Flesnel Lens, Cardboard Binocular and 3D cardboard glasses for more than 25 years, starting as the supplier for local traders and local market. In 1992, Eurofan Products Inc. was established to do the direct sale and service for the clients overseas. Due to satisfactory service, punctual delivery, competitive prices we guarantee to the clients, we extend the service by sourcing and creating new tooling under client's project with production either in Taiwan or in Mainland China. Our main products including flat magnifier, cardboard binocular, 3D cardboard glasses and advertising plastic ball pen, various promotion & giveaway premium and other new items. Eurofan's products include all kinds of Fresnel lens, magnifiers, metal linen testers, desktop paperweights, cardboard binoculars, 3-D glasses, promotional and premiums. 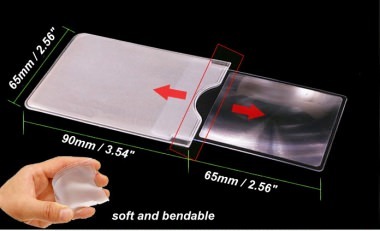 This huge range means you only need to source from one supplier, helping you to save time and money on shipping costs. If experience matters to you then you'll appreciate the fact that we've been in business for over 20 years. We put this experience to work when helping your find the products that you need. We have preferred buyer relationships that we've built up over the years, resulting in cheaper per-unit costs for you. Addr：5F No.85, SEC 2, Keelung Road, Taipei, 110 Taiwan, R.O.c.